The spring season is here and for many folks that means constant suffering from allergies. In Arizona we can get hit particularly hard with allergies in the springtime when the new blooms are coming out. Shrubs and trees on our hillsides and roadways, and in our yards are lovely with the spring blooms, but it means that for many people they are sneezing, have itchy, runny eyes and swollen painful sinus. If left untreated, these sinus issues can end up resulting in sinus infections. Acupuncture and Chinese herbs are a proven method to help relieve these troubling symptoms, without the need for pharmaceuticals, which may cause drowsiness, or other side effects. Acupuncture has been proven to help relieve sneezing and itchy eyes that are caused by seasonal allergies. Also Acupuncture helps to build up the immune system. Often times when people turn to antihistamines for relief they end up being disappointed, as they do not get the relief that was hoped for. From a Chinese point of view, these allergies, ie allergic rhinitis, is due to a deficiency of the Lung and Kidney’s Defensive-Qi systems, combined with retention of chronic “Wind” in the nose. Western medicine views seasonal allergies as a form of immediate hypersensitivity reaction that occurs when anti-bodies that are produced by lymphocytes interact with airborne particles such as pollen. Western medicine describes the locations of lymphocytes in addition to being in the blood stream, as also in Peyer’s patches in the gastrointestinal tract, spleen, lymph nodes, and bone marrow. Maintaining a healthy diet is always important, but can be particularly important to keep allergies from acting up. One interesting thing is that Chinese medicines sees ‘sweets’ as being harmful to the Spleen function. Sweets are often a major factor in the persistence and intensity of seasonal allergy symptoms. This said, if you find yourself being attacked by seasonal allergies, you may want to cut back, or eliminate sweets from your diet. Also foods such as dairy and citrus can be mucus-producing in some people. Other foods to consider eliminating are relatives of common allergens (for instance, the apple family and birch family are related) as these may set off allergies. Also being sure to stay well hydrated, as this is a plus. Be sure to drink plenty of water of a daily basis. A neti pot is an excellent choice to consider for regular nasal rinse. 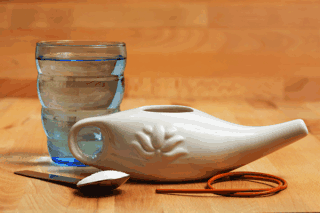 A neti pot can be helpful even if you are not under attack from allergies, nor yet have sinus symptoms. The nose is the way most environmental allergens enter a person’s system. A neti pot can help to wash away these allergens before they have a chance to attack. Neti pots are a safe, natural product (just like Acupuncture). To be effective, neti pots need to be used regularly during allergy season. They can be can be found in most drug stores. Neti pots are not the same as nasal mists. Nasal mists only moisturize the sinuses without getting rid of the allergens. Experiment with the level of salt you use in the neti pot, to find what is comfortable for you. Many people find using their neti pot in the shower works well for them. Several herbal formulas can help with seasonal allergies. Some formulas may be most helpful if they are started several months before the allergy season in order to be most effective. These formulas can help to prevent allergies rather than just treating the symptoms. There are also short-term herbal formulas that can alleviate nasal congestion and relieve itchy eye symptoms temporarily. When you come in for an appointment, we can discuss which formulas may work best for your needs. It is always best to begin Acupuncture treatment before an allergy season. For people with year-round allergies, start your treatments at any time and you will begin to get some relief. During a severe allergy season, you may need more frequent treatments, depending on the severity of your condition. Even for those people who are not plagued with severe seasonal allergies, it can help your immune system to plan for a minimum of four (4) Acupuncture treatments yearly, to help with the seasonal changes and to keep your immune system strong. Don’t suffer this spring season with allergies, give Acupuncture and Traditional Chinese Medicine a chance to keep the allergy symptoms at minimum and help keep you functioning, feeling well, and doing what you need to do.